Is Venezuela's Downward Spiral OPEC's Achilles Heel Or Saving Grace? 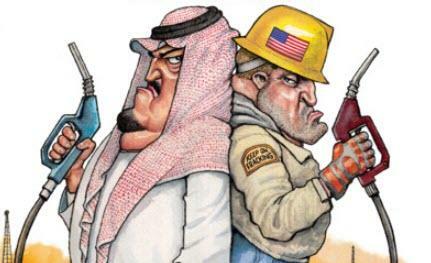 OPEC and US Shale have been duking it out in the oil markets for a few years now - ever since the days of $100 oil. OPEC, led by Saudi Arabia, took up a campaign to flood the market with oil to drown out the rising stars of the US Shale world. But that $100 oil came at a price, and the glut sunk prices to uber lows that hurt every oil producer in the world - some more than others. Venezuela was no exception to feeling hurt. Its state oil company, PDVSA—or shall we say the Hugo Chavez administration’s personal piggy bank—was already reeling from corruption, and was busy fighting with foreign oil firms who were operating in country and subsequently booted out. The country had no money to invest in its cash cow to keep it running. President Nicolas Maduro--who took office when oil producers were for the most part fat, dumb, and happy—inherited along with PDVSA a country that was in crisis, with some even saying back then that it was on “the verge of an economic breakdown”, with Moody’s tallying a public sector deficit of 15 percent of its GDP. And when oil prices started to tank, Venezuela’s dire economic situation became direr. Years ago, Venezuela was an instrumental member of OPEC, with Chavez reestablishing Venezuela’s seat at the OPEC table. Today, Venezuela is still an active member, with Maduro serving as one of the loudest cheerleaders of the original OPEC production cut deal solidified in late 2016 after his desperate-but-successful whirlwind tour designed to save its country from ruin with the increased oil revenues that would likely come from such a deal. Maduro visited all the who’s who in the OPEC oil world, including Iran, Qatar, and OPEC kingpin Saudi Arabia. At that time, Maduro claimed to have a formula that would stabilize oil prices for ten years. That concept, now squarely in the rearview mirror, is clearly viewed as both tragic and laughable, given the recent price swings. Despite Maduro’s ten-year plan being clearly dead in the water, OPEC was still able to pull off a production cut deal that managed to lift prices for a time. In fact, the plan was so successful, that combined with a few geopolitical events between Iran and the United States and China and the United States, and Libya, Nigeria, and Venezuela’s unintentional production outages, OPEC conspired to lift production mid-2018. Some would say this is in part attributed to Maduro’s salesmanship. Coming full circle, the market is once again facing falling oil prices along with another planned production cut from the cartel. Venezuela, who did manage to benefit somewhat from the original production cut deal in 2017, is producing fewer and fewer barrels of oil on a monthly basis, ending 2018 with a daily production level that is near 30-year lows for the Latin American country. And no one is holding onto hope that Venezuela’s oil production will rebound—that is, no one but Venezuela. With Venezuela’s production sure to continue its downward spiral, OPEC is bound to catch a break on the production cuts. OPEC agreed to cut 800,000 bpd this time around, and Venezuela will likely eat away at some of that 800,000 bpd, without even trying. This takes some of the heat off other OPEC members who may find it difficult to curb production yet again. On the surface, this indicates that Venezuela’s OPEC membership is paying off for OPEC. It has been instrumental in getting OPEC members on board to reduce production, and it is cutting its own barrels produced in great numbers, even if not on purpose, allowing other members, such as Iraq, to overproduce without hurting OPEC’s overall compliance. Unfortunately for OPEC, Venezuela’s economic and political situation is so bleak that it has almost no control over its own oil production. It cannot ramp up production. It cannot export more. It has failed to secure this “regular supply of petroleum to [its] consumers” as OPEC’s mission statement calls for. In fact, Venezuela has begged, borrowed, and stolen—literally—to keep PDVSA afloat, and still it sinks. Part of OPEC’s claim to fame is that it has the clout to move oil prices up or down, by moving production up or down—and Venezuela can no longer participate in that activity. OPEC’s clout has waned thanks to the rise of US shale, but also due to what some are seeing as OPEC’s almost-maxed production capacity. Surely Venezuela’s production capacity is maxed, and surely that max will continue to decrease. As Venezuela’s production capacity dwindles, so does OPEC’s, which is likely why Russia and a few extras have been brought into the OPEC fold. In the short term, Venezuela helps OPEC to meet some immediate production cut goals. In the long term, however, Venezuela will likely remain a drain on OPEC’s overall capacity, as it is unable to contribute in any meaningful way to the cartel that relies on production manipulation to swing prices.